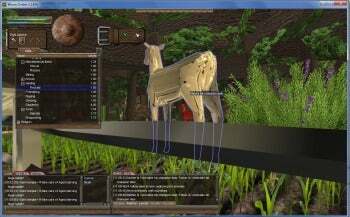 Wurm Online is a sandbox MMORPG game in a fantasy setting. Character creation is a snap--pick a name. No skills, no race, not even a choice of physical appearance. Your avatar is identical to everyone else's. Where Wurm Online excels, though, is in the degree of player control of the world. It could be described as a sort of hybrid of Darkfall Online, A Tale In The Desert, and Minecraft. Wurm Online is free to play, although some premium features are reserved for paying customers. Wurm Online's strong point is its MMORPG crafting mechanics, not its graphics. Crafting in Code Club AB's Wurm Online is very detailed, and objects have weight and size--no fitting 10 suits of armor into a pack with 10 "slots." Damage is dealt out to individual body parts, not just to a pool of hit points, and, most interestingly, with the right tools, you can dig anywhere, eventually striking rock and making a mine or cave below ground. Interesting as the gameplay is, the game isn't much of a looker. Wurm Online's animation of action is as minimal as its avatar detail, and I had many issues with disconnections. The use of photographic textures on low-polygon objects creates an odd air of unreality and shows that the budget has really gone to developing mechanical systems, not visual ones. Once the tutorial is over, the player has a choice of venturing to PVP or non-PVP regions. You can play Wurm Online for free, but you cannot advance skills over level 20 or go to Premium servers. Premium access can be bought month to month using real world money, or buy acquiring silver-coins, which can be bought with real world money or traded from other players in game. Note: The Download button takes you to the vendor's site, where you can register to play and download the latest version of the software.